Of course, to be an Oscar contender the story itself is important, and the screenplay by Marc Haimes and Chris Butler (with story by Shannon Tindle and Marc Haimes) was well written. 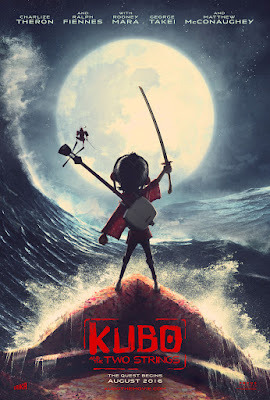 As simple - and predictable - as the storyline itself was, the way director Travis Knight engaged the audience with its simplicity was effective with stirring images and poignant silences interspaced between moments of physical humour and manga-esque action. Nonetheless, the two biggest disconnect with the movie was the casting and the voice attacking.Other than Art Parkinson (aka Rickon Stark) and Rooney Mara - who were great in their roles - Charlize Theron and Matthew McConaughey were simply miscast and lacked vocal chemistry between each other and their character. It seemed like a shameless big-name, headlining-grab for some star power which kind of does reflect the lack of faith the producers have with the original material itself. And that is sad. Dario Marianelli wrote the score for this film, and it is in one word: stunning. Absolutely beautiful and befitting score. It has been a long while since I last felt so attuned with a film's music. One of Marinelli's best score since Atonement and Anna Karenina. I think this film - and the animation - would have been more stunning had it been watched in 3D. It seemed to lend itself very well, like most animation, to that technology.